On a warm day in late June, our caretaker couple Troy and Paula Scott was painting our barn. Around noon they spotted a female promethea moth clinging to her newly-vacated cocoon, which dangled from a spicebush branch. The Scotts called us to come and take a look at this gorgeous, velvety, giant silkworm moth. A rich, reddish brown, she had a bright eyespot on the upper edge of each forewing, and a white, kidney-shaped spot on both her forewings and hind wings. She remained there, no doubt releasing pheromones like a siren’s call, and late in the afternoon a male answered her olfactory plume. With his dark maroon wings, he looked like a different species. But he had found the right mate because male promethea moths look very different form female prometheas. He was also smaller than the female. They mated immediately, both still clinging to the base of the cocoon, and by dusk he was gone. He could have detected her pheromones as far away as 21 miles with his large, feathery antennae, but after mating his life was over. She, on the other hand, still had eggs to lay. We didn’t see her do that, but since promethea moths are also called “spicebush moths” she probably didn’t move from the shrub. She would have laid her eggs in short rows on the leaves of the host plant, which, in addition to spicebush, could have been the leaves of tulip trees, sassafras, wild black cherry, lilac or white ash. However, since the barn spicebush held six other promethea cocoons and the spicebush next to the springhouse several more, our spicebushes seem to be popular with prometheas. The promethea silkworm moth Callosamia promethea was named for the Greek Titan who stole fire from the gods to give to mankind. The Audubon of giant silkworm moths, John Cody, in his beautiful book of paintings called Wings of Paradise: The Great Saturniid Moths, claimed that the promethea was aptly named because of her color, her fiery disposition, which he described as “easily excited,” and her emergence in the heat of a sunlit day. Most moths, even those in her subfamily, Saturniinae, emerge at night. 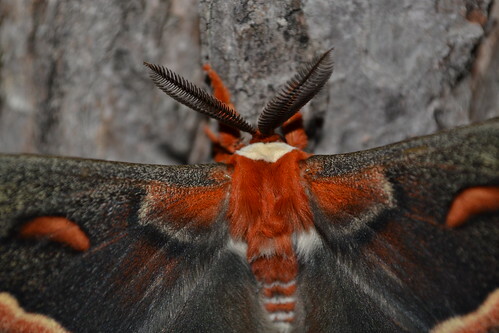 That subfamily consists of 17 species in North America, five of which—polyphemus, luna, cecropia, tulip-tree, and promethea—live in the woodlands and backyards of Pennsylvania. All of them are large, colorful, and attractively patterned. They have velvety wings and tufted legs attached to soft, furry bodies. As moths, they don’t eat or drink because of their undeveloped mouthparts, and they live on their caterpillar fat for the few days they are moths. Their job is to mate, lay eggs, and die. They are called silk moths because of the elaborate silken cocoons they spin. 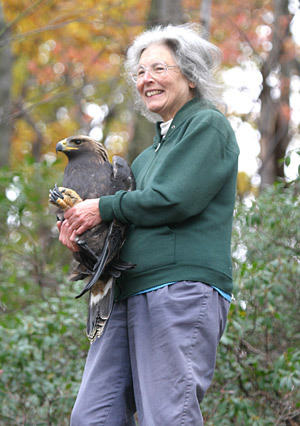 While their life histories are similar, each species and even individual may vary in their choice of egg-laying sites and whether or not they produce one or two broods a year. Biologists have discovered that there is a biological clock in the caterpillar brain that can measure the relative amounts of daylight and darkness to an accuracy of 15 minutes per day. Depending on these measurements, the caterpillar will either spin its cocoon and then emerge as an adult or go into diapause, a pupal stage that reduces its metabolism and cell activity so it can winter over in its cocoon and emerge the following spring as an adult. 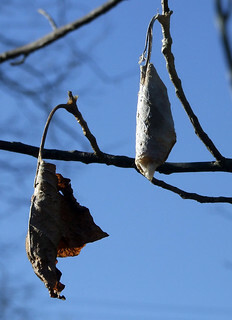 For instance, if a polyphemus moth, in its 4th instar, (one of the last larval stages between molts), detects 16 hours of daylight, it will pupate and emerge later as an adult, but if it detects only 12 hours of daylight, it will go into diapause. It continues to monitor photoperiod as a cocoon through a clear patch of pupal cuticle until its pupal brain responds to rising spring temperatures and triggers it to emerge as an adult. Cecropia moths need a much longer time to develop than other giant silkworm moths and have only one emergence from late May through July. But in our area the luna, promethea, tulip-tree, and polyphemus often produce a partial double brood because offspring of a single female may have both fast-developing individuals that produce a second brood and slow-developing ones that pupate and enter diapause. In general though, late spring and early to mid-summer are the best times to find emerging adults. Once a giant silkworm moth emerges, it crawls to a support or clings to its cocoon, as our promethea did, spreads its wings by pumping hemolymph ( a clear, green, liquid that fills a caterpillar in place of blood) into its wing veins and waits until those wings harden before flying. If it is disturbed or during its first flight, it discharges meconium, the waste it accumulated as a pupa. Usually, most species, especially the males, disperse in a brief flight at dusk. Females release pheromones by protruding a special gland located at the tip of their abdomens. Those pheromones have specialized chemicals that identify her species to a searching male. Each species also synchronizes their mating activity during one or more specific 24-hour cycles. Except for the tulip-tree silkworm moth (Callosamia anguilifera), which feeds only on tulip tree leaves and both sexes look like a brighter version of its close relative, the promethea female, the other giant silkworm moths are more catholic in their tastes. In fact, wild black cherry tree leaves and those of lilac shrubs are so popular with many giant silkworm moths world wide that they are called “universal donor” plants by scientists who use them to feed laboratory specimens. Females find appropriate plants for egg-laying by smell. Polyphemus moths (Antheraea polyphemus), which have pinkish-cinnamon wings and a large eyespot on each wing, like ash, birch, grape, hickory, maple, pine and especially oak leaves. Apple green luna moths (Actias luna), also displaying an eyespot on each wing and have long, elegant, slightly twisted tails, prefer alder, beech, cherry, hazelnut, hickory, walnut, sumac, or willow leaves. The gorgeous cecropias (Hyalophora cecropia) are the largest of our giant silkworm moths and have grayish brown wings highlighted in red. They are also the most cosmopolitan, even thriving in urban areas on ornamental shrubs and small trees, especially maple, wild cherry, plum, apple, birch, alder, dogwood and willow tree leaves. 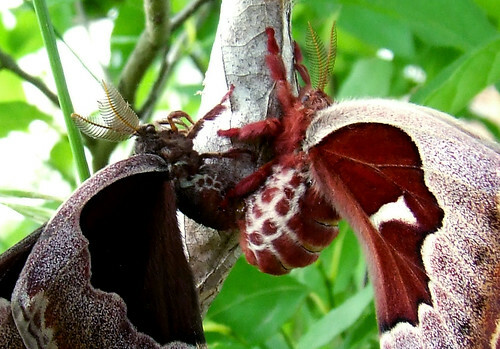 Also, while a female cecropia has only one partner, like the other giant silkworm moths, the cecropia male lives longer than the other male silkworm moth species and can have as many as three partners in his three nights of life. Here on our mountain, we saw a cecropia clinging to a black walnut tree trunk near noon on July 4, 2011. Cecropias do emerge in mid-morning and stay quiet until the following morning at 3:30 a.m. when mating begins and continues until daybreak. The one we saw must have been a male because it was gone by 10:15 p.m., off in search of a female whose plume he could follow as far away as seven miles. We seem to have two broods of lunas because I observed two mating at 9:00 a.m. on May 19, 2011 on a mountain laurel shrub, and two years in a row we saw a luna on a black walnut tree trunk on August 2, 2009 and August 6, 2012. They usually emerge in the morning, mate from 1:00 a.m. to 2:00 a.m., and then stay connected until the following evening unless they are disturbed. I can’t remember when we last saw a polyphemus or tulip-tree moth. Most people today rarely see any of these giant silkworm moths. The artist, John Cody, who grew up in the Brooklyn borough of New York City back in the 1930s, fell in love with giant silkworm moths at the age of five when he found a cecropia. It smelled like peanut butter and didn’t move no matter how close he came to it. “I had seen perfection,” he said of its fiery red body and splendid wings. But when his book was published in 1996, he mourned the mysterious disappearance of cecropias in the 1970s. Even though his neighborhood hadn’t changed that much, no one he questioned there remembered seeing any cecropias. 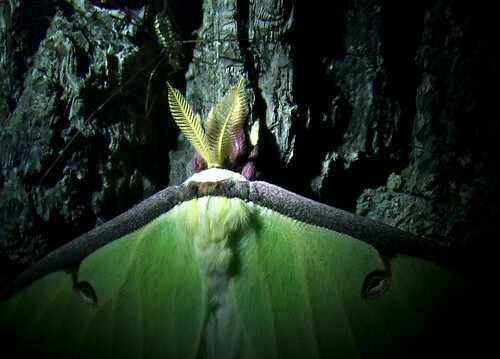 Not only the cecropias but all the giant silkworm moths have suffered a decline in the northeastern and Mid-Atlantic States, which some researchers have attributed to suburban sprawl, mercury light pollution, or the spraying of the bacterium Bt (Bacillus thuringiensis) for gypsy moth caterpillars. However, the most likely culprit appears to be the parasitoid Compsilura concinnata, a tachinid fly with a broad host range that was introduced into our country, along with nine other parasitoids, to kill gypsy moth caterpillars. While giant silkworm moths have numerous predators, including birds and bats, their most relentless and effective enemies are parasitoids, especially the families of wasps and flies that attack Lepidoptera (moths and butterflies) larvae. Some are generalists; others specialize in families or even genera. Usually they live inside the caterpillar and feed on its hemolymph and fatty tissues. The female parasitoid finds her victims by smelling caterpillar frass (feces) and/or leaves they have damaged. Using her ovipositor, she lays one or more eggs in or on the caterpillar. When the parasitoid hatches, it burrows into the caterpillar. Some large ichneumonid wasps, attracted by the smell of freshly-spun cocoon silk, even attack cocoons. For example, one such wasp was observed attacking a cecropia cocoon by extending her ovipositor through a partially spun cocoon, laying her eggs, and stinging the caterpillar spinning the cocoon. But, in general, caterpillars in their last couple stages of molt suffer their heaviest losses from parasitoids. 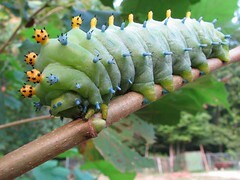 Their study of cecropia caterpillars on understory wild black cherry trees found that none of the 500 cecropia larvae survived to the pupal stage. Most were killed by C. concinnata, a whopping 81%. 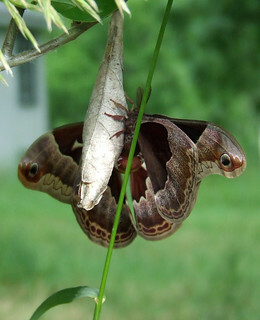 They did a follow-up study on polyphemus caterpillars and found that the attack rate by C. concinnata was even higher. Another study by Virginia researchers on luna caterpillars recorded a 78% rate for C. concinnata. Photos by Dave Bonta except where indicated. Click on any photo to view larger versions on Flickr.